What Is Anesthesia-Free Preventative Dentistry also known as a PTCA? Your pet’s oral health plays a major role in their whole-body health. Frequent brushing and regular professional teeth cleanings go a long way to ensure a healthy mouth and happy dogs and cats. A preventative teeth cleaning helps minimize bacteria build up in your pets mouth through frequent teeth cleanings in between your regular anesthetic dental with radiography. Although the anesthesia-free preventative cleanings are not a replacement for an anesthetic dental that provides detailed information with radiography of tooth roots, it is the missing piece in your pets preventative health recommendations to reduce how often your pet may need to undergo anesthesia. Mountain View Animal Hospital and Holistic Pet Care recommends that dogs and cats start to receive their annual preventative teeth cleaning at a young age, to prevent disease to the gums and enamel that may be permanent. The PTCA procedure performed at Mountain View Animal Hospital & Holistic Pet Care is designed to be used for routine teeth cleaning and polishing in an effort to prevent major dental disease from starting and progressing. Just as you are not placed under a general anesthetic when you have your teeth cleaned by a hygienist, we do not feel it safe to anesthetize animals repeatedly solely to clean their teeth. The animal is gently restrained and trained to accept the procedure, and the results are excellent. 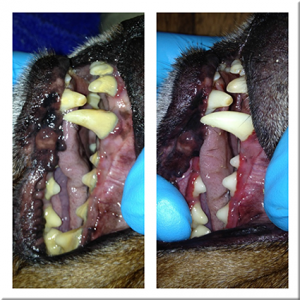 The teeth and gums are carefully examined and visible debris is removed. The teeth are cleaned with an ultrasonic scaler and then polished. A PTCA may also may be used on animals that have advanced heart and kidney disease that are too compromised for general anesthesia. Our Veterinarians will make additional recommendations to you if our examination reveals problems that require a complete dental prophylaxis or dental surgery. The Preventative Oral Exam and cleaning performed on your pet at Mountain View Animal Hospital & Holistic Pet Care is considered to be a Dental Cleaning procedure, and is not recognized to be a complete Dental Prophylaxis as determined by the American Veterinary Medical Association. A complete dental prophylaxis consists of radiography of the roots of the teeth, and an extensive cleaning comprised of subgingival scraping and examination, as well as scaling and polishing of the teeth. This is performed under general anesthesia and may require full blood panels. Current veterinary protocol is for this procedure to be performed annually.